This ‘thing’ that you will hang can’t necessarily be temporary, only because making two nail holes in the wall wouldn’t be worth it. So, it has to be perfect. Did I mention cost? If you’re looking for a piece of art, often times they can be very expensive from an art studio or a store like Von Maur. Sometimes you can find great pieces of art at Gordmans, Target or Hobby Lobby (especially when you can find something for 90% off). They all cost money. And sometimes, you just don’t want to spend money on art. I have the perfect solution for you. Create something! Yes, you. Here is an easy solution that anyone could do, even your kids. Start with a blank canvas. Sometimes this can be daunting, but trust me on this one. The small canvas is a 16 x 20, the large one is something like 40 x 50. They come in just about any size, depending on the wall space you have. Add some painter’s tape in a random pattern. Or you can use a measuring tape and make perfectly equal lines. But who has time for that? I like the non-perfect look myself. Find a few colors you like, and then paint! Don’t worry about how light or dark it is. Just paint. I used acrylic paint for mine. You can find acrylic paint at Walmart, Hobby Lobby, etc. 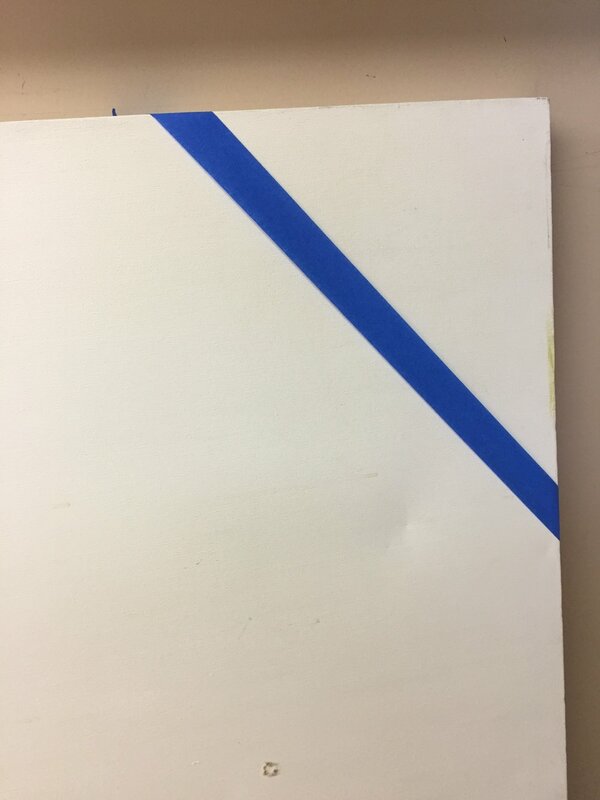 Once it dries, remove the tape. Bam. You have yourself a beautiful piece of art. Priceless. Unless you had to buy the canvas. Then in that case, super inexpensive. Even though I like the non-perfect look, I did try to be a little strategic with it. I wanted small and large 'shapes' and I wanted to be able to hang it horizontal or vertical, so I planned my colors accordingly. I also wanted to be able to see my brush strokes, so that's why you see the light parts in each color. You know the best part? I can take it down and use it on my mantel. I can use it in a different room. It’s so versatile. Just for more inspiration, here are a few examples of some art my aunt (Denise) and my friend (Teal) created themselves. Denise isn't finished with hers yet, but how awesome is this!? Teal painted the entire canvas grey, then once it dried, played around with metallics. Isn’t it lovely? She has the canvases hanging in her living room above her couch. The colors she picked match perfectly with her living room! No tape, no measuring, just painting! Teal's paintings remind me of one more thing. Because Bryn and I are the creative type, we wanted to do something special and meaningful for our wedding. For our unity ceremony, we did a canvas painting! Bryn had gold and I had pink, and while our friend Rach read this (unity-ceremony_canvas-painting), we painted both colors on the canvas. Someday we will build a frame for it. This canvas painting will forever tell a wonderful story. What have you created for your walls? Send me your ideas! And, if you try this out, let me know how it turns out. You just might surprise yourself! Newer PostKitchen Update - Exciting News!